If you plan to trade at a Wagga Wagga event as a food stall vendor, you are required to be registered with Council and obtain the necessary approvals. To register a temporary food stall with Council, please complete and submit the registration form below. Submissions must be made to Council at least 14 days prior to the event or activity for consideration. Please ensure your Food Safety Supervisor Certificate (if required) is available to be uploaded. It is essential that you comply with the relevant requirements and Temporary Event Guidelines. Click below for useful links to help you understand your legal obligations. *Please Note: This application does not provide approval to operate on a public footpath. Should you need to carry out activities on a public footpath, a separate application form (Display of Goods) must be lodged with Wagga Wagga City Council. Failing to comply with the requirements or the selling of foods that do not comply with the requirements may render the food business liable to prosecution. Vendors of foods which cause injury or illness could be sued for damages. 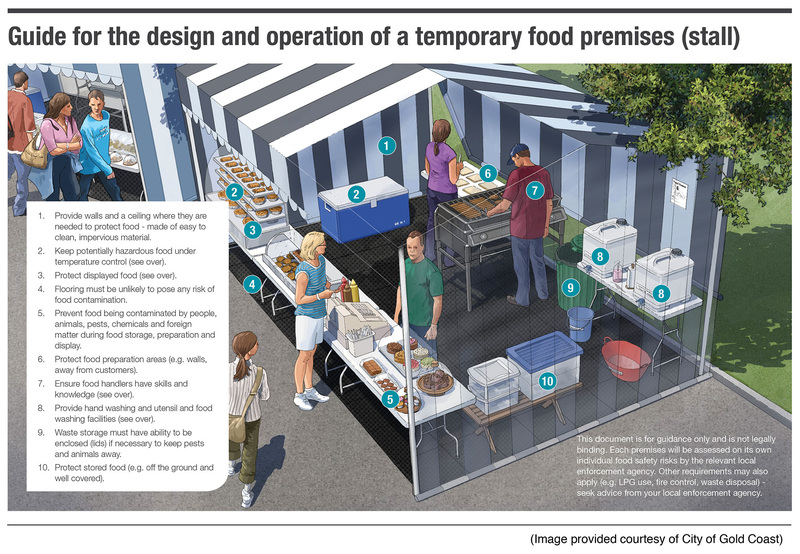 A Temporary Event is any occasion which is not permanent in nature where food is provided at no charge or for sale to the consumer. 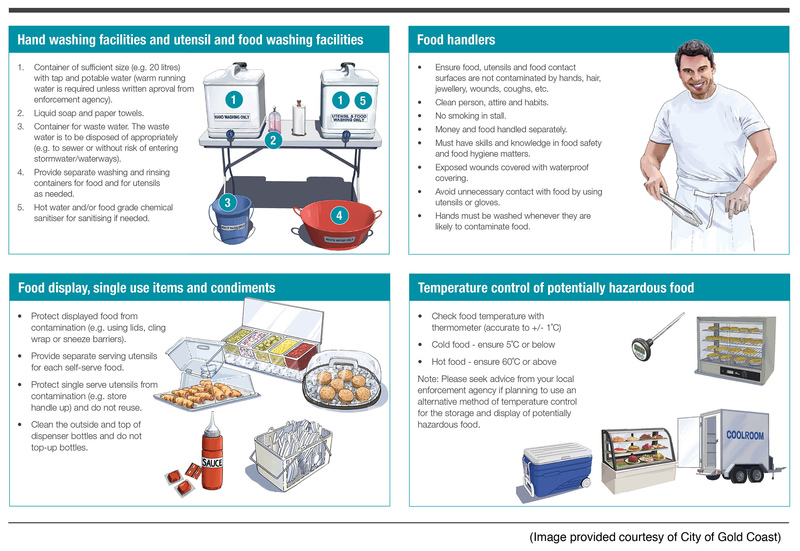 The primary aim of this document is to make food businesses aware of their legal requirements and to suggest ways to assure food safety at the event. Prior consent of Wagga Wagga City Council is required for the overall event. Upon satisfactory submission an Approval by Council will be granted. If you are selling butchers’ meat, fermented manufactured meats, raw poultry, dairy products, seafood or plant products, you will need to be licensed by NSW Food Authority. Contact with NSW Food Authority must be made before the event to find out the requirements on 1300 552 406.
a) All persons engaged in the preparation, handling, storage or transportation of food shall maintain themselves and their clothing in a clean and tidy condition at all times and shall not be suffering from any communicable disease or illness that can be transmitted by the food being handled or prepared. b) Food handlers shall not smoke tobacco in any form where food is being prepared, stored or transported. c) No person shall use unclean or printed paper in such manner to allow surfaces of that paper to come in contact with any food. d) Every person who is engaged in the manufacture, preparation, storage, carriage or delivery of any food shall keep at all times such food and receptacles, implements, vehicles, utensils, benches, fittings and other appliances used in connection with foods for consumption, clean, free from dust, foul odours, flies or other insects. e) No animals, birds or plants shall be permitted in any area where food is being prepared, stored or transported. f) No food shall be provided in returnable containers. g) Hand washing facilities and a supply of liquid antibacterial soap together with an adequate supply of water shall be required where direct contact is made Page 5 of 6 with food during its preparation and serving. h) Where food is stored prior to cooking, it must be stored below 5°c. i) All food and other ingredients used in the preparation of food shall be obtained from approved sources. j) The event organiser must keep a record of the source of food used in the event. k) All reasonable measures need to be taken so as not to compromise the safety and suitability of food. A person designated as a “food handler” may be required who is limited to handling food. l) A bin is to be provided for waste with a close fitting lid. a) All potentially hazardous food shall be stored under temperature control. b) All storage areas shall be constructed and positioned to prevent the entry of vermin, flies, dust, insects or any other contamination. Transportation of all food shall be in specialized transport or in a normal vehicle which is thoroughly clean and the food is fully protected from contamination. Where temperature control is required during transportation, the food shall be kept in clean containers or units, capable of maintaining the required temperature of 5oC or less for cold food or 60oC for hot food. a) All food and equipment shall be displayed or kept above ground or floor level. b) Benches, trestles etc shall be clean and kept in good repair, smooth and free from contaminating substances. a) All food which is not prepared in front of the customer must be packaged in material that is fit for its intended use. b) All packaging shall be suitably labelled, showing: Description of food, date packaged, name of the responsible person, address, and product name. c) All ingredients used in the product must be indicated on the labelled product. Mandatory and advisory warnings e.g. lupin, nuts, milk, gluten, royal jelly etc.